Three games in one - Triple the fun or triple the terror? 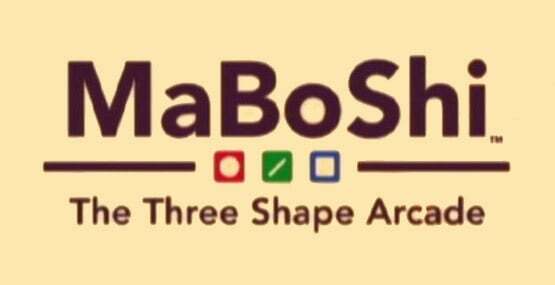 MaBoShi: The Three Shape Arcade is a rather unique game from Mindware, a company that's relatively unknown outside of Japan. 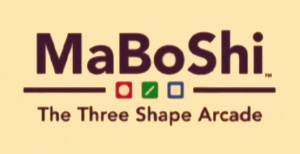 As the title suggests, MaBoShi is based around three shapes - Circle, Stick and Square. The gameplay comprises three mini-games based on these shapes, which all challenge you to the simple objective of beating the best high score. Mess up once and it's game over! It doesn't sound very interesting on the surface, but there is more to this game than meets the eye. To begin, you are presented with three vertical rectangles on your screen, lined up from left to right. At the top is a list of all of your Mii avatars. 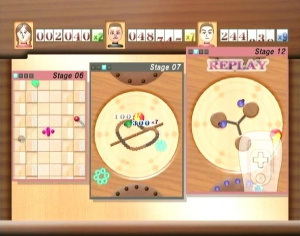 Drag your selected Mii into one of the rectangles and you will be able to choose one of the three games, which you will then begin to play in the selected rectangle. The games are fairly basic, but they are not mastered easily. The Circle game puts you in control of a ball, which is located in a circular playing field. The ball is always on the move, and it will continuously try to go in one direction. If you press the A button, it will change direction and go the opposite way. Using this tactic, you have to try to defeat swarms of enemies that appear in the playing field before they manage to reach the edge and escape. At first, you will probably be able to beat the levels very easily, but later on, there will be added obstacles in the "arena", such as a ball attached to a rope that swings around when you hit it and thus blocks your movement. And no, it won't take out enemies! The Stick game involves a stick attached to a circular object known as the "core". The stick continuously swings around the core. Hold the A button to swing in the direction the stick is spinning toward. The stick will then lose some swinging speed, so you'll have to wait for it to pick up the pace before you can move again. Slowing the stick down enough will cause it to change its swinging direction so you can move the other way, if you want. The objective in each stage is to simply progress upwards, avoiding enemies and walls. The stick can destroy whatever crosses its path, but if they hit the core, you lose. Occasionally, you'll come across items such as a pinball, which can be knocked around with the stick to destroy everything it hits, or an invincibility item, which temporarily allows you to move without any speed loss, and makes the core invulnerable. Every few stages you will encounter a fiendish boss fight to keep you on your toes. The Square game is a bit less action packed and would suit those with a more strategic mindset. To the untrained eye this might at first appear to resemble the popular mobile phone game “Snake”. You control a little square and move around square-shaped spaces. In your wake, however, you will leave a trail of fire. Your objective is to use this fire to burn all the other coloured blocks you will encounter across every stage. If the fire touches an empty square located next to the coloured ones, it will spread across and start to burn up the rest. You have to be fast though: with each step you take, the screen scrolls up slightly, and if anything that is not burnt or still burning touches the bottom edge of the screen then its game over! These games sound simple, but the genius here is that they work together as part of one big game. In single player mode you play one of these games occupying one of three rectangle-shaped screens, but once you've played for a while, AI players will begin playing games in the other two screens (You can also let two other human players play games in them). This isn’t just a cheap way to fill up the two empty rectangles fortunately; the three rectangles cleverly interact with one another. For example if you're playing the Stick game, and the next rectangle has the Square game, and you move the stick close to the edge of the screen, it will actually appear in the Square game and take out any blocks it hits! Defeat enemies in the Circle game and they'll go careening in the direction you bashed them. If you happen to bash them into the Stick game, they can bump into enemies there and defeat them. If they fly into the Square game, any coloured blocks they hit will automatically catch fire and begin to burn. Each burnt block in the Square game will send ghostly square outlines into the other two games, which will also kill any enemy they hit. 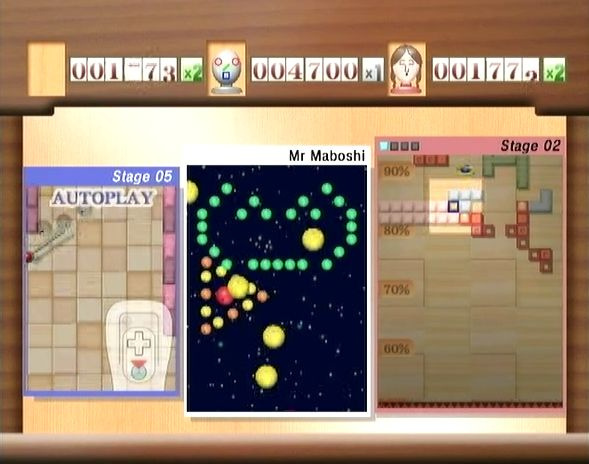 Occasionally, while you're playing, one of the other rectangles will suddenly feature the appearance of Mr Maboshi, a man whose face is made out of the three shapes. 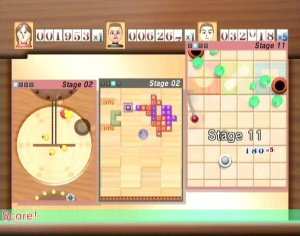 As a variety of shapes begins to fall down in this screen, he requests that you obtain one million points in his screen, which must be done by using the "interactivity" features of the other games to hit the shapes and score points. This is not as difficult as it first appears, as your score is saved. If you can't get one million before Mr. Maboshi leaves, no worries: every time he appears, you'll continue with all the points you collected for him so far, so getting one million shouldn't be too challenging even if you're terrible at the game! When you finally hit the million mark, you will unlock a new wallpaper to use as the background behind the games. After this you can try to get one million points for Mr. Maboshi more times for more wallpapers! The games are all very simple, but also very fun. MaBoShi isn't a game you'll play for hours at a time, but firing it up once every day and trying to beat one of the high scores will most likely keep you entertained for quite some time. The overall goal is to get one million points in all the games, try accomplishing that! With a friend or two taking part and interacting with your rectangle, this is one very entertaining package. There’s more too: if you have a Nintendo DS, you can send a download version of the game to it. 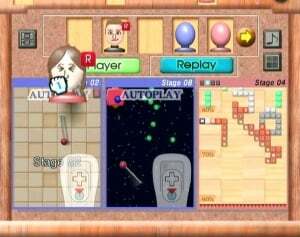 In the DS version, there is just one playing field, and your DS is held sideways so that the screen is vertically aligned like the WiiWare version, using the d-pad for control in all games. The DS version has downgraded graphics, understandably, but the gameplay and music are intact. If you like the game and would like to take it with you on the go, this is perfect. Just don't shut off the DS -- put it in sleep mode by closing the lid when you're done, or you'll lose the download! The only small gripe would be that your achievements on the DS download do not in turn feed back to the WiiWare version of the game to unlock anything, but it is still a clever idea. 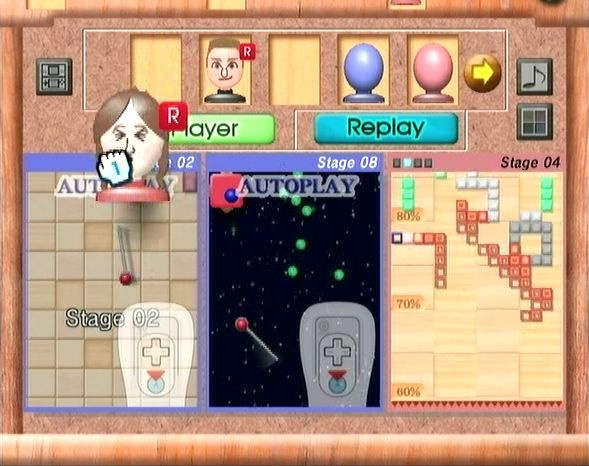 As a final extra feature, it is possible to send replays of your best scores in the Wii version to friends via WiiConnect24. You can also make these replays play in the game screens, while you play a new game in another! The replay will also interact with your game like a live game would! MaBoShi is a very strange and unique game. Perhaps it is not one that will keep you glued to the screen for hours at a time, but it really is addictive and will have you coming back often to try to better that elusive high score set the day before. With friends around, the proposition is even more attractive. The game is complemented by a surprisingly excellent soundtrack and the Nintendo DS download version is the icing on the cake. Nintendo made a good choice in publishing MaBoShi outside of Japan, which is a testament to the potential they saw in it. If you fancy something completely different to experience on WiiWare, this might just be the game for you. I'll be sure to get this once it hits North America. I'm definitely getting this when it hits North America. WOW 8/10 is really unexpected! I played it with friends for hours and we all rated it 3/10 and told everyone to avoid downloading it! Save your WiiPoints for something more exciting... more fun. Maybe it would be better in the time of the C64 - but not today and not on Wii. Another 8?! WOW, WiiWare is having a lot of good games. I mostly agree with the review. It is a great game. Once you play for a while it's amazing what degree of control you can have on the Circle and Bar games with just one button. A very original and fun game indeed! Thats it im trying to decide what to delete next . Well i try downloading it soon but i don't know what to delete . I think you're becoming very generous with giving good ratings (well the site in general). Although, im not a puzzle game fan so im not a good person to judge. Well we have gotten several 8/10's in a row. Perhaps the reviewers know what to expect from a wiiware game now instead of comparing it to cheaper retail games? Not trying to insult anyone, I just wonder if it wiiware or wiiware-world hitting its groove here. Well slap me silly! I was expecting this game to be a boring piece of crap, but it is good after all. Judging by the videos, it doesn't look like anything that would set the world on fire, but it looks like an interesting way to kill some time. DS connectivity is a plus too! That's Nintendo for ya. They can make the most boring-looking crap seem entertaining. @BuzzDee - For the record WiiBoy is indeed someone from Bplus. Lets hope that Plättchen turns out to be as good as this! He probably gave it an 8, because you can send a demo to your DS. The game isn't more worth than a 6 IMO. Nintendo really should publish some of their other games outside Japan, particularly Yakuman Wii. Their other games though are probably based on some games that we wouldn't be too familiar with. How's the game doing on the popular titles section of the Wii Shop Channel in Europe? @+matthew²: Just Critter Round-Up is behind. Quick question: will I go back to play it more often than the mini games of Wii Play which I tired of really quickly? I like the look of it (especially with the DS download version - my DS needs something new to do after I completed Guitar Hero and threw it across the room in Picross rage), but I just don't know if it will last me very long. I think this game will have more mixed opinions than any other WiiWare game so far. If you like to come back to games such as WarioWare to improve scores, or if you're just looking for a unique game, you'll probably like this. Otherwise it may be best to play it safe and stay away. OK... I have now made MaBoShi my eigth WiiWare download, and am so far enjoying it. It is very different to other WiiWare offerings currently available, but very addictive. Once I unlock the DS download, I will be overjoyed with the new portable puzzliness - here's hoping it will be my new favourute high-score-em-up over Geometry Wars. By the way the block size is 81 Blocks and not '121'. I'm getting this for sure!!! The total block size is 121 - We put together the game size and the save size for every game. The game is 81, the save is 40 blocks (No doubt because of the replays). Can the save blocks be transferred to an SD card? How does the game utilize WiiConnect24? Wont be getting this as im fed up of puzzle games but i think its great they have a downloadable ds version with it, love to see that with other wi ware games. It's taken a long time, but WiiWare actually has a title to stand alongside FFCC, Toki Tori, Actionloop and Star Soldier R as being a worthy addition to the service. Definitely worth the 8/10 score - nice work Nintendo! Guess I have no reason to buy Plattchen now considering I'll be playing this game on my Wii and DS for a long time. any idea when plattchen will be released. @ andy836 - It was scheduled for an August release but was delayed so I'd say a September release is very likely. This is perhaps one of the more original puzzle games I've ever heard of. At first I was setting myself up for disappointment when I read how the interactivity between the rectangles was done with multiple players, 'cause I never really have anybody to play with, but hearing that you can achieve the same thing with replays... Well, it certainly won't be as fun or as real-time as with other players, but it's good to know I wouldn't be left out entirely. I'll definately consider this if it comes out in the US. And to the guy who said the game looked boring in video, honestly, I've never seen a puzzle game that looked interesting in video. The game never interested me but when it appeared on the Shop Channel last Thursday night I sat and read through the online manual and my intrest was piqued. I dont think that it is a must buy title but it does seem to have a lot of interesting ideas about it and the DS download is also a good idea. 800 points seems good value for money to me but I still have a couple of titles I would like before this. Another average game that have a good review. 8 is for good, not average. And the Helix review is among the worst review I read. Beside, I don't understand people talking about price for being intersted or not for a game. If I don't care for a 1000 points games, I'm not going to like it because it's 900 points. Well if we do get this game tomorrow since its Labor Day holiday ill definitely gonna get it... one of my favorite type of games to play! This deffo seems to be splitting people... had considered it, might have to try somehow before buying. I think I might pass on this download for a rainy day. . .if/when it comes to America of course. I'm really happy to see that we got this game in .eu as I was expecting a Japan domestic release. As for me, I really enjoy this kind of games so for me, the 8/10 rating is justified. Loving it! I hope it comes out in NA today!!! My Aquarium, Super Mario RPG and Clu Clu Land! I used to play clu clu land as a kid, please people, dont get my aqaurium, its just not good! Well looks like it didnt come out today but hope it comes out soon though like this month hopefully... but at least i got my favorite wiiware game now "My Aquarium"... just downloaded and playing it right now.. im loving it! I'm loving this, you hardly ever see such good action/reflex games outside of Japan. The DS version is a brilliant addition. However, I am so bad at the stick game it's embarrassing. More practice needed, I guess. 9/10 on Eurogamer. It's not just WiiWare World who think this is full of win! @msephton - you are lucky to have this game and hope it comes to the NA soon like this month or next week at least. I just wish good games like this would sell better. Thanks to the review I bought it and I am really pleased with the game. 800 Points are a good price and it's kind of addictive too. @Kenji510: it's worth the wait! I just dicovered a secret in the circle game - there is so much depth here! game of the year for me. Intresting, I have 400 point so If I get another 2000 I could get this and bomberman blast. But i only have 300 blocks. I have deleted FFCC, toki tori and pop and got ocrina of time (boss!) and lyat wars (poor) in their place. I cannot wait for this to come here. The low block size appeals to me even more! Dang, i really want this, Please come to NA soon! I just finished reading the review, watching the video, and looking at the screenshots. I think I will download this game immediately! Well, almost immediately. It looks so cool! This is coming from a guy who hardly ever downloads anything. Good thing I still have 1100 Wii Points left! Just got this game today and IT PWNS. DS Download play is a cool feature but play with the sound off. Anyone saying that it LOOKS stupid/boring should still give this a try. It doesn't look fun, but it is. And anyone who has played it and says it's a 3/10: ???!!! I got this game looking for a fun puzzler fix after the sublime WOG...this game does not satisfy. The thing is I keep going back to it hoping that it will get better, but about five minutes into playing I'm looking for another more fun game to play. I'd say 8/10 is an extremely generous score. More like a 6 for me. You have to play this game to appreciate how good it is. I'm extremely disappointed with the game. Yeah, it has great features such as an cooperative 3-player-mode, a downloadable version for your Nintendo DS, Mii support and interactive replay saves. But the main problem is the main game: The 3 minigames MaBoShi consists of, they are just bland, boring and very repetitive. You also have to start from scratch, you cannot save. And if you make one mistake the game is over. So it's not only boring, it's also frustrating and unforgiving. I had very high hopes on this one, I thought it was a great innovative title, but it's nothing more than 3 uninspired minigames that you can play with the press of a button. No depth, no originality, no fun. From the 10 WiiWare games I have this is the worst one by far. Avoid it. 3 / 10. One point for each game. I'd give a higher score, if the game was 500 points, because of the good features it comes with. But for 800 points, you should get yourself a SNES classic. This is one of the best titles on the entire WiiWare service, ignore the detractors! It's not something that you sit with for hours at a time, but it is enormously entertaining each time to come back to it for a few minutes and try to best your high score, especially once you start using the recordings of your best scores on the other two panels while playing the third, leading to a bizarre interaction between your former and current play. I have to agree with warioswoods, this is really one of the best WiiWare games. This game is fun with friends, but by yourself you can only really play it for an hour or so.